Probably I should have heard a recording of this famous piece as well. Do you have any really worthwile recommendations? It seems like this Previn account is highly acclaimed, and cheap as well. I wont claim this to be the definitive recording but it is good and is my favorite (mainly because it has all the incidental music mixed with short quotes from the play). Warning: Must enjoy other Marriner efforts to consider this recording. Not over the top....smooth account. Beecham on EMI for the overture. 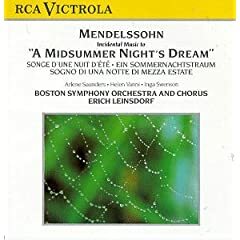 For the incidental music, there was an old CD of Leinsdorf with the Boston SO that had very brief readings from the play in English. Enough text to give some atmosphere, but not so much that it detracts from the music. There are still some copies at amazon. For the overture I would chose Szell with Cleveland. For the incidental music, Klemperer (with Harper and Baker) or Kubelik (with Mathis). I second Klemperer. Not an obvious choice, perhaps. But old Otto makes the music sound great. Maybe I'm hopelessly old-school, with recommendations bogged down in LP-land, but I've long loved Maag on Decca/London. Still do. Very good recording and beautiful playing by the LSO. Did this one simply not survive the transition to CD? Or are his excerpts not extensive enough to compete with the others mentioned? Szell is up there, too. In addition to the overture with Cleveland, there's a smattering of other pieces with the Concertgebouw that he did way back when. Wish he'd done much more. Worth hunting down. 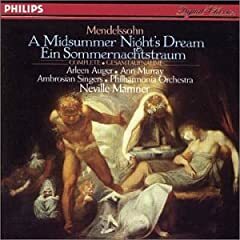 I've been listenting to this piece a fair amount recently, because my daughters (grades 4 and 6) are doing the play at their school and my wife is making the costumes, so the music helps as inspiration. It suits me fairly well, though there are some weirdly long pauses between some passages (well, only 5 sec or so). Doesn't have quotes from the play and whatnot, however - though it does come with an interesting aria called "Infelice" as filler. It's not perfect, but it's $3. it's not perfect, but it's $3. 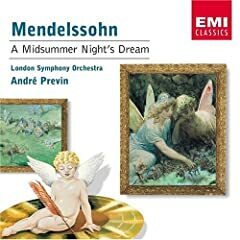 You must have a pretty low opinion of Mendelssohn's music to think that "it's only $3" is an important factor in recommending a recording that, in many cases, people can be expected to keep for decades. Claus Peter Flor is the best conductor i have heard live so far. Does anyone have any idea of his discography? I am completely shocked that he doesnt appear so often in everyone's weekly buys. Maybe he doesnt record much? He's very good - hailed in the late 80s and early 90s but disappeared from the recording scene somewhat. But he was one of the most impressive conductors to lead the MPO on a guest basis. Fantastic control and atmosphere in the Prokofiev R&J as well as a good Bruckner 5 (though it did not beat the live Karajan/BPO experience I had in London in 1980/81 season). Howard - I also have his (CP Flor) Dvorak Sym 8 and Serenade for Strings. Not heard the MSND though. Actually I like the CD and music. I'm a high school student with no source of income (it's all being saved for college), so for me it IS important to consider price. Well, we understand you Brian. Make note of all of our fav. versions of your fav. music and when you are older and can afford multiple versions, you can buy our top picks.